Back in the early ages of gardening, someone realized covering a plant could protect it from frost and wind chill, preserving blooms and protecting foliage from the ravages of ice crystals and dropping temperatures. In Victorian gardens and parlors, dome-shaped glass covers protected many tender and treasured plants from the nip of winter’s chill. Because of the resemblance to a close-fitting, bell-shaped woman’s hat, these protective devices were called cloches, the French word for hats. You’ve probably seen them over a plant in someone’s garden or greenhouse. Today, in addition to protecting plants and extending the growing season, they provide a touch of whimsy and romance for an elegant garden, terrarium or greenhouse. Our gift store offers several sizes, materials and styles of cloches for garden use. 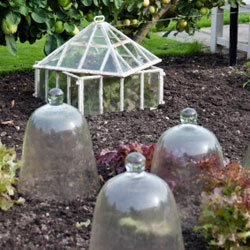 The clear glass bell-shaped cloches are also popular for in-house decorating. Placed over a miniature orchid to enhance its growing environment or protecting a treasured arrangement, these gardening items show your trend setting and eclectic gardening style. They are ideal for specimen plants, or may be used to showcase a vintage vase, whimsical fairy garden, lush succulent arrangement or favorite potted plant. Even indoors, they provide protection to regulate the humidity and temperature near a plant, eliminating damaging drafts and helping keep delicate, temperamental plants happy. Although the original cloches protected only one plant, the “cloche concept” now effectively extends the outdoor growing season for row crops. Modern technology and new materials make it easy to continue growing even after the temperatures drop. Hoops, tents and row covers protect late crops from frost and wind, extending the season and ensuring later harvests for the full richness of the fruits, vegetables, herbs and flowers that need just a bit of extra time to mature. Whether you hope to sell late season crops and want to improve your profit margin or would prefer a later harvest for extra canning and preservation, these tools can increase your season and improve your yields. We have a large selection of protective materials including frost protection blankets, plastic row covers and curved hoops to hold the cloth above the plants without damaging produce or bruising leaves. Furthermore, if you want the growing season to never end at all, you can consider cold frames and miniature greenhouses that can keep your green thumb bright and active even on the coldest days. Come on in to see our complete selection, and keep on growing.